Sunday is for staying in your pj’s and playing on the internet. Here’s what I found this morning. 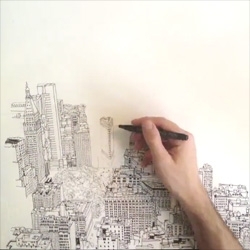 A time-lapse of illustrator Patrick Vale drawing the view of the Manhattan skyline from the Empire State Building. WOW! That was fast!! Incredible inking. I wonder how long it took him to do the whole process.